During this afternoon’s Amazon Q2 conference call, there was one topic that was clearly on many analysts’ minds: the Kindle. 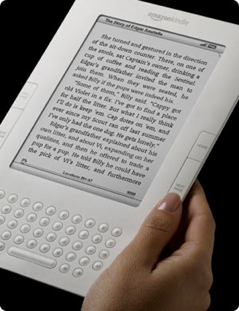 With the recent release of the Kindle DX and the Kindle 2 only a few months before it, the financial success of the device is still very much a mystery, especially since Amazon has long been tightlipped about releasing any Kindle sales figures. CFO Tom Szkutak, who led the call, kept to that script. Another analyst asked about Amazon’s plans to finally bring the Kindle to an international audience (it has only been available in the US until now). Szkutak didn’t rule out the idea, but didn’t commit either, stating, “Kindle International is certainly an opportunity. Our customers have certainly expressed an interest. We’ve had a practice of not talking about what we might do, but certainly it’s an opportunity.” I’ll be very surprised if we don’t see more news in this area soon, as this is a huge untapped market. Amazon’s lack of transparency is especially frustrating because the Kindle may well be something of a canary in a coal mine for the entire Ebook industry. No other E-book device has gotten as much exposure, and frankly the Kindle is likely the best device out there. Without statistics about how well Amazon’s Ebooks are selling, or even knowing if the Kindle is going to be available to the (very large) international audience, publishers and authors being left in the dark. We’ve done our best to shed some light on the matter: according to our historically reliable sources, as of April, the Kindle 2 had sold 300,000 units at a pace twice that of the original device. We should note that while Amazon’s acquisition of Zappos was briefly brought up during the call, few questions were focused on it. Also interesting: only a few hours before the call, Amazon CEO Jeff Bezos apologized for its bizarre decision to remotely delete copies of 1984 and Animal Farm from the Kindle.